You can find a taste of luxury and style in Shinola watches if you are coveting fashionable timepieces. 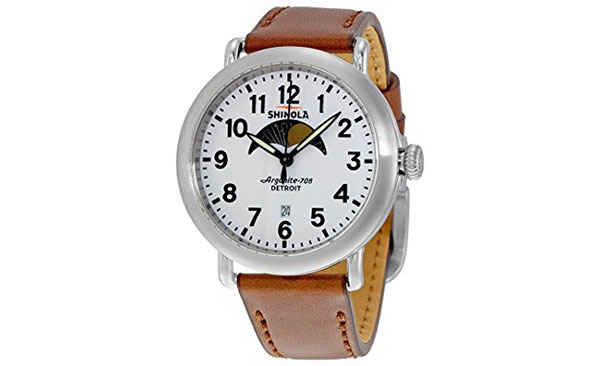 Shinola is an American luxury lifestyle brand which specializes in watches, bicycles, and leather goods. Unlike other expensive models that cost thousands of dollars, the Detroit-made Shinola watches are a reasonably affordable. 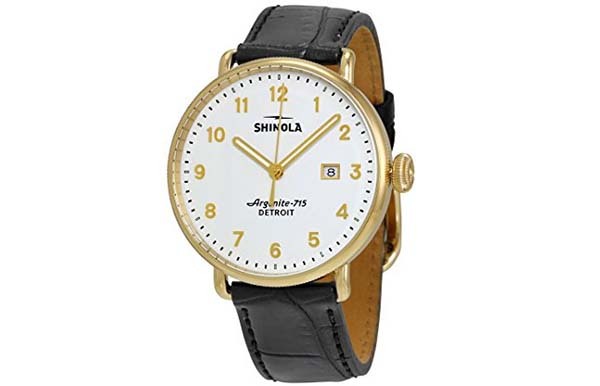 Are Shinola watches good? Just go through this Shinola watch review and you will find it out. 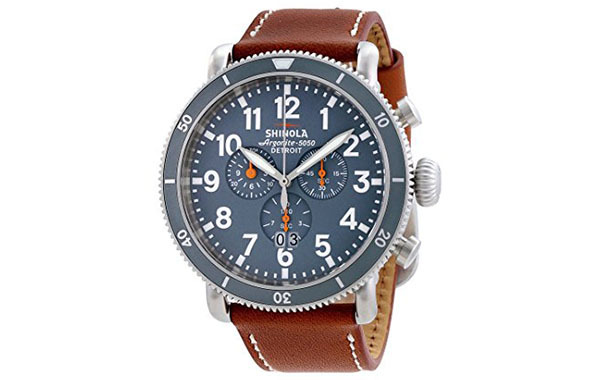 There are six Shinola watches in this Shinola watch review article. And they are mainly come form the Runwell series. Shinola Runwell collection is one of the trendy signature collections of the Shinola brand. The collection has an assortment of faces, bands, lengths, and colors. Based on personal style and how one intends to use a Runwell model- formal or casual , it is possible to choose from an assortment of metal bracelet, nylon strap, or leather band types. Read on to get a glimpse of Shinola’s six best pieces. The Runwell chronograph watch is a timepiece with a 47mm (diameter) stainless steel round case and a black leather strap. The stainless steel case guarantees longevity and worth for your hard-earned cash because the watch is corrosion resistant. Its silver-tone hour markers and hands in the background of a black dial give a distinct contrast that enables you to read the time easily. The markers and hands are also luminescent. So the users of this model can have no problem making a reading in low light conditions. For greater accuracy in reading time, the timepiece has two sub-dials within the dial, which enable the user to read the minute and second. Therefore, you can read your time precisely to the second. Minute markers are also etched on the outer rim of the case. And these too can be used to read time to the minute level. In addition, there is a date display at the six o’clock position, which enables the user to read the date. The stainless steel case’s face is scratch resistant because of the sapphire crystal that covers the dial. And you can be sure that the minor scratches will not diminish the glimmer of your watch. The Runwell Chronograph uses quartz movement. That means you will be sure of greater time accuracy and less maintenance when compared to watches that use mechanical movements. This model is an ideal sport watch for your outdoor escapades. Pros: 1. Simple yet elegant design. 2. More accurate compared to mechanical watches. And luminescent markers and hands make it easy to read time in low light conditions. 3. Unlike the mechanical watches, it requires less maintenance. Cons: 1. Unlike watches powered by mechanical movements, which are wound for free, there is a need to change the watch battery once it gets flat. 2. It is a sport styled watch and it may not suit people seeking other styles of watches. The Runwell Sport Chrono is a watch with a 48mm (diameter) stainless steel round case. The stainless steel case offers a corrosion resistant protection. And it is strapped to a tan Beaumont strap of leather, which is tough and long lasting. This model’s dial is made of a slate grey dial that has silver-tone hands with a luminous capability. That allows user reading in low light conditions easily. The hour markers in Arabic numerals have similar properties that make the reading of time easy in low lighting. The outer rim of the watch’s case has minute markers that allow precise reading of time. Its dial also has three miniature dials that display 60 seconds, 1/10th of a second, and 30 minute timing, which help in precise time reading. The Runwell Sport Chrono also has a solid case back and a sapphire crystal, which is scratch resistant. These two prevent water damage and enhance the aesthetic appeal of the timepiece. Apart from reading the time, users can also read the date at the six o’clock position. The Runwell Sport Chrono uses quartz movement. This means that users will be sure of greater time accuracy and less maintenance when compared to watches that use mechanical movements. Unlike the Runwell Chronograph, this model is more precise in time determination because it has additional dials. As such, it may be ideal for people engaged in research or sporting activities where precise timing is important. Pros: 1. Accurate quartz movements with little requirements for maintenance when compared to watches with mechanical movements. 3. Luminescent markers and hands that allow the user to check time in low light conditions. 4. Water resistant up to a depth of 100 meters. Cons: 1. The watch requires regular battery change because the quartz crystal movements are powered by the battery. 2. The model is water resistant only to a limit of 100 meters. As such, the watch cannot be used by divers because it can sustain damage in deep waters. The Runwell Moon Phase is a unique timepiece. It has additional functions such as batter eol indicator and lunar phase tracking through an incorporated moon dial. The watch features a solid and round stainless steel case, a sapphire crystal, an analog dial, a fixed bezel, luminescent dial markers and hands, and a screw down crown – all on a case with a diameter of 41mm. The luminous hands and dial markers are ideal for reading time in the dark or low light conditions. It is possible for the user to also read the date at the six o’clock position on the white dial. Minute markers are also etched on the outer rim, and these markers allow accurate time-reading to the minute level. The Runwell Moon Phase uses quartz movement. So this guarantees great accuracy in time-reading and less maintenance when compared to watches that use mechanical movements. The case is strapped to a tough leather strap, which give the watch a firm hold round the wrist using a Tang clasp without the worry of getting cut by tugging forces. The moon dial in this model is handy for die-hard fans of horoscope reading and users interested in reading lunar phases for astrological purposes or any other interests related to lunar phases. The watch is ideal for casual modes of dressing and it would be a little odd to wear it with official clothing such suits. Pros: 1. The model incorporates a moon dial, which allows the user to track lunar phases. 2. The watch is scratch resistant and the user can worry less about potential rough handling of the timepiece because it can survive scratches. 3. The model has a tough stainless steel casing that is corrosion resistant. 4. The luminous hands and white dial of the model is ideal for people with eye problems or users that would like to check out the time in low light conditions. Cons: 1. The model cannot sustain water damage beyond 50 meters because it is only water resistant in depths below 50 meters. 2. Unlike mechanical watches that are simply wound, this quartz movement watch requires regular battery change. Shinola The Rambler is a beautiful American timepiece that is built to last for decades. 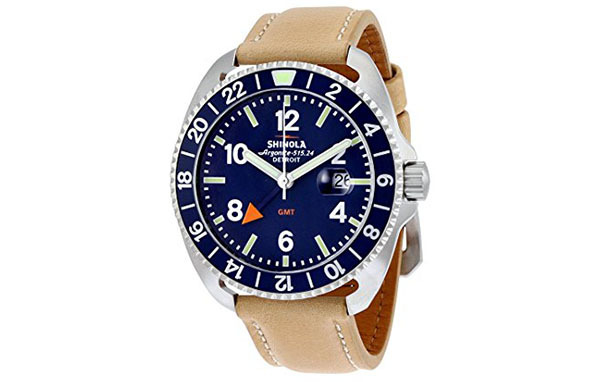 The watch features a stainless steel case and a brown tan leather strap that drastically changes its look. Additionally, the watch also features a unidirectional rotating stainless steel bezel with a dark royal blue top ring displaying 24-hour markings in white. The watch comes with an analog dial with a dark royal blue, a flagship color of the latest timepiece series produced by Shinola. On the watch’s face, there is a second hand and date feature, silver tone hands and markers, Arabic numeral hour markers and a scratch resistant sapphire crystal glass. The date on this watch is displayed at the 3 o’clock position. The majority of watches produced today come with quartz movements, one of the most accurate types of watch movements. Shinola The Rambler is one of the watches with this kind of movement. So basically, it is one of the most reliable and accurate analog timepiece available on the market today. One thing to keep in mind though is that quartz watches require battery change from time to time. A lightning bolt is placed on the watch’s back to represent the company’s commitment to quality. Other specifications of this watch include 44 mm case diameter, 22 mm band width, a buckle clasp and water resistant at 100 meters. In a word, featuring an attractive leather strap and stylish dial, the Rambler stainless steel watch will add a classy touch to your look. The Rambler feels great on the wrist and can make you smile each time you look at it. Pros: 1. Reliable and the most accurate watch available on the market today. 2. Stainless steel materials which make the watch durable. 3. Form-fitting, comfortable and stylish leather strap and very low maintenance costs. 4. Water resistant up to a depth of 100 meters, making it suitable for swimming and snorkeling. Cons: 1. Need battery replacements from time to time. 2. If you are looking for a watch with automatic movement, this model is not for you. The Canfield Gold PVD is the first Shinola’s wrist watch built using a top loaded case design. This is a detailed technique that provides a state of the art open dial viewing area displaying a sophisticated minute track and diamond-cut hands. This is one of the details about the Canfield you won’t find it in other wrist watches. The watch features a stainless steel case with a high-quality black alligator leather strap. Unlike the Shinola The Rambler which comes with a unidirectional rotating bezel. This model comes with a fixed bezel Bezel material made of Gold PVD. The watch comes with an analog white dial with a gold-tone Super-LumiNova hands and indices, Arabic numeral hour markers, scratch resistant sapphire crystal glass and minute markers around the outer rim. The date is also displayed next to the 3 o’clock position. The Canfield Gold PVD’s engine is an Argonite 715.3 quartz movement. Its manufacturer says has been hand-assembled from several imported components. Other specifications of this watch include 44 mm case diameter, 22 mm band width, a buckle clasp and water resistant at 50 meters. With its robust construction, unique design, and reliability, the Canfield Gold PVD is one of the stylish fashion watches for those who want to draw attention by being elegant. Pros: 1. Features a unique design and robust construction. 2. Quality is top notch from dial to strap and from movement to case materials. 3. Deisgned with a high-quality fine leather strap which not only makes the chronograph a dress watch but also enhances style and comfort. 4. The sapphire crystal is clear and easy to clean. 5. Luminous gold-tone hands and Arabic numeral hour markers. Cons: 1. It is only water resistant in depths below 50 meters. 2. Need battery replacements from time to time. 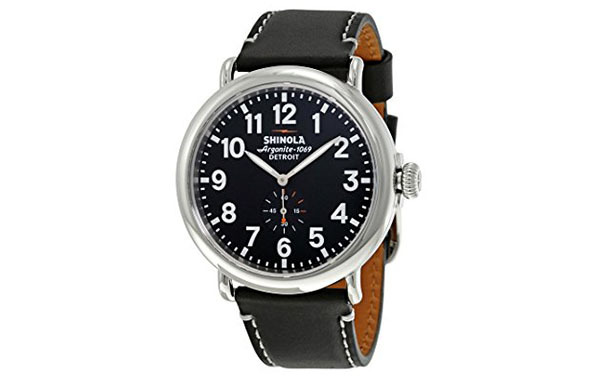 The Runwell Black Dial Black Leather watch is another timepiece from Shinola designed to be worn by men. This wrist watch comes with a stainless steel case and a durable black leather strap. Just like the Canfield Gold PVD watch, this particular watch has a fixed stainless steel white bezel without any markings. It features a matte black analog dial with Arabic numeral hour markers, luminous hands, minute markers around the outer rim and a scratch resistant sapphire crystal. And just like the other chronographs that we have reviewed above. The Runwell Black Dial Black Leather watch displays date next to the 3 o’clock position. Unlike the two timepieces we have reviewed above. 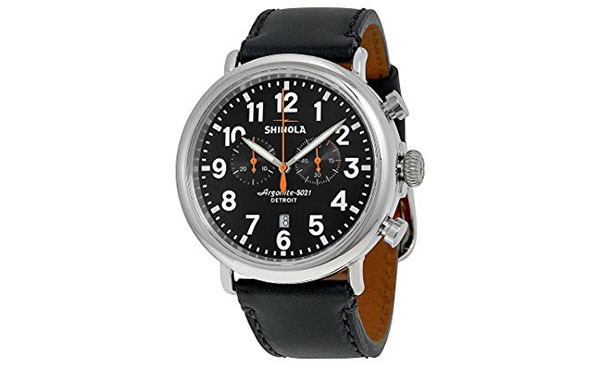 This model from Shinola is designed with a small seconds sub-dial slightly above the 6 o’clock position. Both of these dials are powered by a quartz movement engine. Additionally, other specifications of this watch include 47 mm case diameter, 24 mm band width, a buckle clasp and water resistant at 50 meters. The weight, the size of the case, the sophistication of the dials and the high-quality leather strap are some of the specs that make this watch rank top among its compensation. That said, the watch is worth investing your money on. Pros: 1. An inexpensive timepiece with reliable and most accurate readings. 2. Luminescent markers and hands make it easy to read time in low light conditions. 3. Form-fitting, comfortable and stylish leather straps which require only surface cleaning. 4. Stainless steel case material which makes the watch durable. Cons: 1. Features a quartz movement which requires battery replacements from time to time. 2. The model cannot sustain water damage beyond 50 meters. All these six watches that we have reviewed above are original Shinola watch series. The company is known to produce best possible products which come with reasonable prices. The branch which is responsible for manufacturing timepieces is based in Detroit, Michigan. The team’s spirit is to make great watches which have come to be accepted in America and across the world. These six watches in this Shinola watch review rely on parts that are imported from other countries such as Swiss made movements. They are worth your money, because the designers have incorporated expert craftsmanship, classic style, premium topstitched leather straps and solid steel cases in these watches. In a word, if you want to purchase any of the above timepieces, we recommend you go ahead.